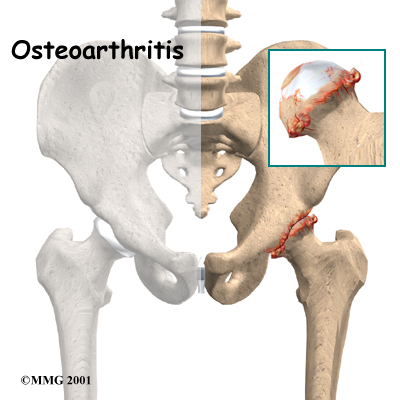 Welcome to Barkman & Smith Physical Therapy's patient resource about Osteoarthritis of the Hip. When you visit Barkman & Smith Physical Therapy, diagnosis of hip OA starts with a complete history and physical examination by one of our therapists. Some patients may be referred to a doctor for further diagnosis. Once your diagnostic examination is complete, the Physical Therapists in Bedford and Irving have treatment options that will help speed your recovery, so that you can more quickly return to your active lifestyle. OA can't be cured, but Physical Therapy is available to ease symptoms and to slow down the degeneration of the joint. 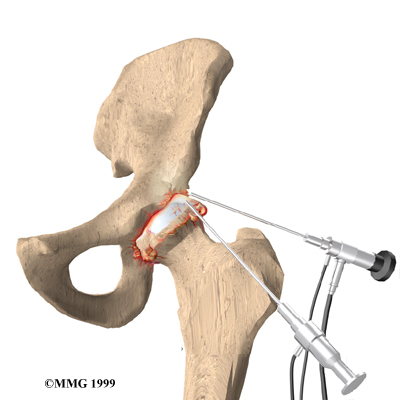 Nonsurgical rehabilitation of hip OA is used to maximize the health of your hip and to prolong the time before any type of surgery is necessary. Recent information shows that your condition may be maintained and in some cases improved. 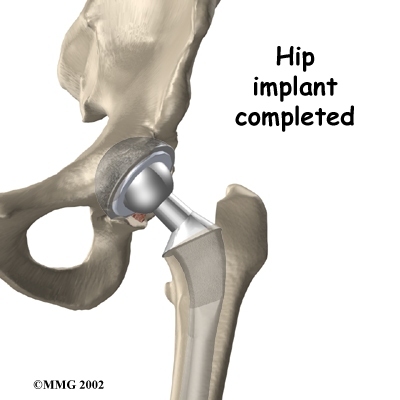 Physical Therapy plays a critical role in the nonsurgical treatment of hip OA. At Barkman & Smith Physical Therapy, our primary goal is to help you learn how to control symptoms and maximize the health of your hip. Our Physical Therapist will recommend ways to calm pain and symptoms, which might include the use of rest, heat, or topical rubs. We may have you use a cane or walker to ease pressure when walking. Our Physical Therapist will use range-of-motion and stretching exercises to improve your hip motion. 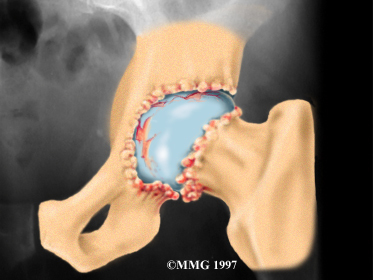 You will be shown strengthening exercises for the hip to steady the joint and protect it from shock and stress. Our therapist can suggest tips for getting your tasks done with less strain on the joint. Although the time required for recovery is different for every patient, you will probably progress to a home program within two to four weeks. When you begin your Barkman & Smith Physical Therapy post-surgical rehabilitation, our Physical Therapist will develop a personalized program of exercises to improve your muscle tone and strength in your hip and thigh muscles and to help prevent the formation of blood clots. Our Physical Therapist will also make recommendations about your safety, review special hip precautions and make sure you are placing a safe amount of weight on your foot when standing or walking. A few additional visits to our outpatient Physical Therapy facility may be needed for patients who continue having problems walking or who need to get back to physically heavy work or activities. Our goal is to help you maximize hip strength, restore a normal walking pattern, and do your activities without risking further injury to your hip. When your recovery is well under way, your regular visits to Barkman & Smith Physical Therapy will end. Although we will continue to be a resource, you will be in charge of doing your exercises as part of an ongoing home program. 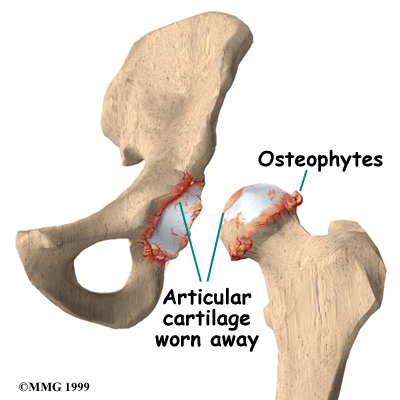 Your doctor will order X-rays to determine the extent of the cartilage damage and suggest a possible cause for it. Your physician may prescribe medicine to help control your pain. Acetaminophen (Tylenol) is a mild pain reliever with few side effects. Some people may also get relief of pain with anti-inflammatory medication, such as ibuprofen and aspirin. Newer anti-inflammatory medicines called COX-2 inhibitors show promising results and seem not to cause as much stomach upset or other intestinal problems. Ensure that you consult with your doctor or pharmacist regarding the use of pain relief or anti-inflammatory medication.